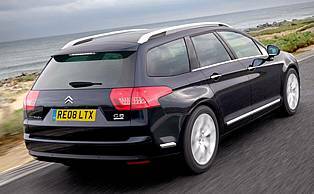 Citroen has upped its game with the new C5 saloon, aiming the car squarely at the German premium opposition with high levels of quality, specification and refinement. The introduction of the Tourer model brings added versatility to the range and broadens its appeal to buyers needing more space and with active lifestyles. 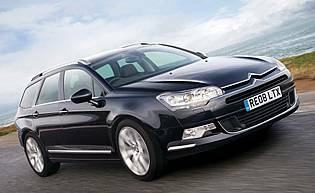 French manufacturer Citroen is one that has always been particularly proud of its Gallic heritage, but even it has had to concede that it pays to be German in the D-segment. It's among the many company's fighting to steal business and retail customers away from the big three by claiming to offer an equally premium product. With the new C5, Citroen has produced a stylish and highly attractive model. A long and elegant wheelbase is accompanied by a low roofline, maintained even with the estate tailgate. 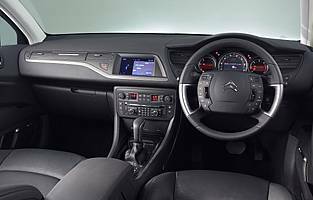 The C5 is also a big step forward on the inside; a soft touch dashboard and high-end technologies such as an electronic parking brake, a digital dash and lane departure warning system have trickled down from the executive C6 resulting in a more luxurious D-segment model. Citroen's Hydractive suspension remains, but there's now the additional option if a conventional steel spring set-up too, depending on the engine and trim. The engine line-up is also varied, with a two petrol and four diesel range culminating in the 2.7-lite V6 diesel unit. In order to bring the model in line with the German competition, much effort has been put into the refining the ride quality and driving experience, with additional soundproofing added and sports settings for the Hydractive suspension and automatic gearboxes. Tourer models benefit from standard fit roof bars for larger loads, while tinted rear side and tailgate windows add ensure privacy for occupants and luggage. Additionally, an electric tailgate can be fitted, and models with Hydractive suspension benefit from automatic self-levelling, and can also be lowered on demand to ease loading. The new C5 is undoubtedly a vast improvement over the old and the higher specification models are certainly closer to the German frontrunners in terms of quality and providing an executive feel. The Tourer retains the stylish, quality feel of the saloon but offers sufficient space in the rear to make a viable load carrier or the ideal family car. The C5 starts with a very reasonable asking price, but Citroen's desire for the model to be viewed as an equal to premium German models means the price can rise sharply depending on trim level, engine choice and specification. The 2.2-litre diesel unit offers respectable fuel economy and insurance costs, aided by a high level of safety equipment, should not be extreme. The C5 Tourer is even better than the saloon in terms of space, with generous head and legroom front and rear, plus a cavernous boot. There are numerous storage areas up front, while the boot is dotted with hooks and lashing eyes to secure any cargo. The C5's digital instrument display is one of the model's highlights. The neatly designed display instantly impresses with its ability to convey information at a glance. Far from gimmicky, it's easy to read, very stylish and backed up by traditional speedometer, rev counter and fuel gauge. The upgraded infotainment system in the centre console is less impressive in terms of ergonomics, with some small and fiddly buttons. The static central hub of the steering wheel also hosts a high number of controls, but these are well positioned and easy to locate and use. As always, Citroen excels when it comes to comfort levels within the C5. The excellent ride quality makes the C5 comfortable for both driver and passengers, as does the high level of sound proofing from triple door seals and a reinforced roof lining that helps eliminate road and wind noise. Seats are well bolstered and extremely comfortable and there's even the option of a back massage function for the driver. As you'd expect, the C5 has remote central locking and is fully alarmed with deadlocks. It also has the ability to lock itself if left alone for 30 seconds after being unlocked. The C5's laminated windows are able to deal with multiple blows, meaning they won't immediately shatter to allow burglars access. Seven airbags and ESP with traction control is standard kit on the C5, but there are many additional safety devices, too. Swivelling headlights offer a better view of the road ahead, a hill start system is present on most models including the Exclusive tested and so is Citroen's lane departure warning system that vibrates the driver's seat in the event that the vehicle starts to drift across lanes. Safety tests have shown the C5's structure to be particularly crash resistant. The C5's Hydractive suspension with auto self-levelling offers an extremely smooth and refined ride, with the sports option firming things up for a more spirited driving experience. The steel spring suspension also available on the lesser specification models offers equally enthusiastic handling while steering is responsive on all models. The 2.2 litre diesel engine, although not as smooth as the larger V6 diesel unit, offers very reasonable performance with smooth acceleration, although the six-speed manual gearbox requires a more deliberate action at times. The C5 is able to comfortably switch between a family car role and a business tool. Its spacious, accessible and practical design is parent and child friendly and the car is ideally suited to long motorway journeys, making summer holidays a breeze. 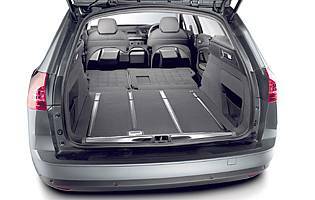 The estate configuration is perfectly suited to family life, with the boot able to swallow a child's buggy with ease. The C5 is an unlikely choice as a first car, being more suited to business and family use. Although easy to drive and inexpensive to run, new drivers would probably want to consider something smaller. Citroen makes no secret of the fact that the C5 is the French manufacturer's attempt to rank alongside the German companies in terms of build quality and materials. The higher specification models are certainly an improvement, although it would be a stretch to say they are the equal of premium manufacturers. The lesser specification models are a little plain inside but the C5's attractive and distinctive exterior styling means it has plenty of kerb appeal in all guises. The increased dimensions of the C5 Tourer over the saloon means even easier access front and rear. The large tailgate makes loading easy too, easier still if the electric tailgate and Hydractive suspension are specified. The Exclusive version can be specified with high quality Philips NXT speakers, which not only look good with their hexagonal designs but also sound great. Opting for the NaviDrive system will add a 10GB hard drive to the CD, radio and MP3 capabilities of the sound system. The small buttons on the NaviDrive system can make it hard to navigate, but the wheel-mounted buttons are easier to use, as is the standard stereo system. The phone system requires a SIM card to be inserted into the card slot. As with most D-Segment saloons the C5 Tourer looks better in understated colours despite its more eccentric styling. Inside, soft touch materials have been used in and around the dash, which certainly adds to the quality feel. Cloth and leather interiors make use of good quality materials and aluminium trim, particularly on the steering wheel, is a nice touch. Visibility is generally good around the C5 and reversing is not a problem with the vertical tailgate making it easy to judge the car's extremeties. Reversing sensors are standard on the Exclusive trim level and it's also possible to opt for a system that measures the size of spaces to see if they're large enough for reverse parking. Full size steel spare under boot floor. Petrol engine options - 1.8-litre (127bhp); 2.0-litre (143bhp). Diesel engine options - 1.6-litre (110bhp); 2.0-litre (138bhp); 2.2-litre (173bhp); 2.7-litre (208bhp); Transmission options: five-speed manual gearbox, six-speed manual gearbox, four-speed sequential auto-adaptive automatic, six-speed sequential auto-adaptive automatic. Trim levels: SX, VTR+, Exclusive.